Ruth Waddy was an artist, advocate, activist, and author primarily known for her work with the Black Arts Movement in California in the 1960s and ‘70s. She was born January 7, 1909 in Lincoln, Nebraska to Willie Anna Choran and John Moses Gilliam. The family moved to Minneapolis, Minnesota when she was four. At school, the children called her “Banana” because her name was Willana Ruth Gilliam, so she asked her mother for permission to use her second name. She identified herself as Ruth Gilliam from then on, and included the initial “G” as part of her name until she became a full-time artist. She attended the University of Minnesota from 1927 to 1928, then moved to Chicago before making her home in California. She became interested in art during World War II after hearing about classes offered through an African American newspaper. Although primarily self-taught, she completed in 1962 the Famous Artists Home Study Course at Los Angeles City College. In 1965, she studied at the Otis Art Institute of Los Angeles County, known today as the Otis College of Art and Design. 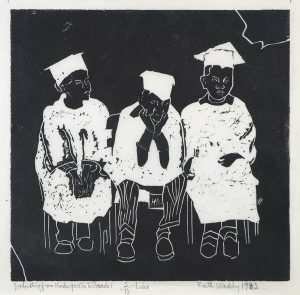 Printmaking was Waddy’s main medium, and she remained a prolific artist until she died in 2003 in San Francisco, California. Ruth Waddy was included in the exhibition A Greater Spectrum: African American Artists of Nebraska 1912-2010 on view at the Museum of Nebraska Art from December 4, 2010 to April 3, 2011. The Museum of Nebraska Art has one work by Ruth Waddy.